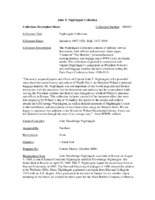 Papers and effects of John Trowbridge Nightingale (1888-1954), businessman, military veteran and aide to President Wilson. He was Wilson’s personal baggage handler and train scheduler during the Paris Peace Conference from 1918-1919. Later he was a partner in Spencer Trask & Company until 1939, when he established the firm of Nightingale and Company, investment brokers. He was at the time of his death president of Cromwell & Company, investment counselors.